Every year, a handful of teachers around the country get into trouble when insensitive Halloween costumes and social media combine to form a toxic mix of bad publicity for them and their school districts. 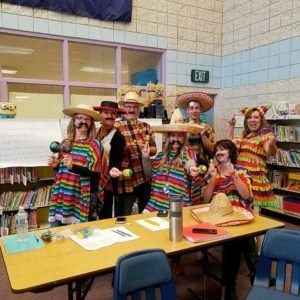 The Middleton School District in Idaho may have set some sort of dubious record, however, by placing 14 elementary school educators (13 teachers and the school principal) on administrative leave following fierce criticism of two poor group costume choices. Although Middleton Heights Elementary School is roughly 1,000 miles north of the nearest point on the U.S.-Mexican border, near the city of Mexicali (Canada is less than half that distance to the north), just under 13% of the elementary school students are Hispanic/Latino. 2016 vote totals may do more to explain their costume choices: Donald Trump defeated Hillary Clinton by nearly 22 percentage points in the state of Idaho and by nearly fifty points in Canyon County, where Middleton is located. All Social Media Is Global: The balance of the story is completely predictable. Someone (it’s unclear exactly who) uploaded photos of the winning costume designs to the school Facebook page. Within a few hours, members of the community began redistributing and commenting on the posts. The school district phone number was circulated, links were posted to the U.S. Department of Education Office of Civil Rights and the ACLU of Idaho, and a petition was launched demanding that the educators be disciplined. Even though the photos were quickly removed from the elementary school Facebook page (and as a matter of fact, the entire page remains shut down as of right now), the images were shared thousands of times. The story quickly became a national and even an international sensation—one of the outlets that picked up the story was Univision News, which tagged it “racismo” (“racism”). Two Sides to Every Wall Costume? The morning after the images appeared, Middleton School District Superintendent Josh Middleton (seriously; I checked) posted a Facebook Live video in which he apologized on behalf of the District for what he called “clearly insensitive and inappropriate” costumes. On the morning of Saturday, November 3, Middleton announced that the thirteen teachers who were pictured and the school principal had been placed on administrative leave pending an investigation. Although much of the online reaction was critical (in fact, negative comments were cited as the reason for shutting down the school and district Facebook pages), many spoke up in support of the teachers. Middleton resident Hailey Foreman, after peevishly writing on Facebook that “[p]eople don’t care to learn the background on this issue, just blindly follow the media,” claimed that “[t]he reason the Mexican group and the USA group was pictured is because they won, because they were the easiest things to dress as, because there are very clear stereotypes for these countries. The teachers chose to dress as those stereotypes and went all out, which is why they won.” A petition was launched on Change.org under the title “Save Our Middleton Teachers, Staff, and Principal,” which gathered almost 17,000 signatures (although there is no way to determine how many of the supporters actually live in Middleton). 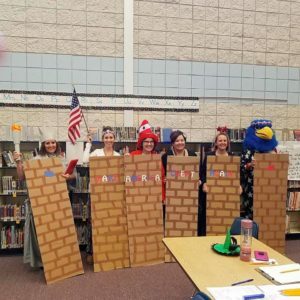 Others argued in response that the “very clear stereotypes” were precisely the problem and that the teachers, with a full week to plan and design their costumes, should have reflected on the impact that they would have on their students. Many also pointed out that the teachers made a particularly dubious choice given the fear that many Latino children feel these days, regardless of the citizenship status of their parents. Social Media and Cybertraps Training: I would respectfully suggest that in addition to cultural sensitivity training, it would be wise for the district to have its educators and staff review Cybertraps for Educators and consider some social media training as well. One issue about which I’d like more information is exactly who posted the photos to the school Facebook page. At the very least, the Middleton School District (like every district across the country) should pay careful attention to who has access to district and school social media feeds, the criteria used for permitting content to be posted, whether content is reviewed prior to posting, and so on. If there is one unequivocal takeaway from this incident, it’s that there is nothing that happens in a school that social media can’t make worse. Thirteen Idaho teachers and an elementary school principal are suspended after photos of allegedly offensive Halloween costumes circulate on social media.